Tu B’Shevat is the ideal time to start a conversation about anything green. My three and a half year old daughter is fascinated by the concept of things that grow. Unfortunately we have only a small back yard, and in the blazing heat of an Australian summer, it’s not an ideal time for planting. Also, she likes it when things grow overnight – something not easily achieved. 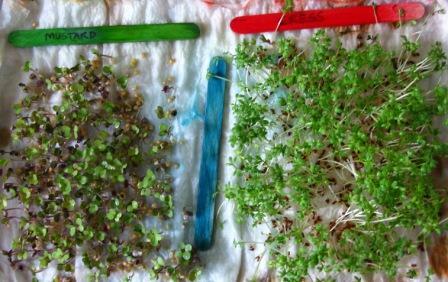 Then I remembered from my own childhood the joy of growing cress. I bought a packet of seeds, and the scent which wafted out transcended decades! – a flat, waterproof container. I used an old baking tray, but something like an icecream container lid or takeaway container or lid would work just as well. – kitchen towelling, or cotton wool, or any other absorbent material that you can keep damp. 1. Place kitchen towelling/cotton wool on waterproof container and wet with water. I used about 6 layers of paper towelling, as it’s very warm here at the moment and I wanted something I could keep damp overnight. 2. Sprinkle with seeds – the more the merrier. My seed packets advise planting mustard seeds 4 days later than the cress seeds if you want to harvest them together. 3. Cover the seeds with a sheet of paper until they germinate. It’s OK to peek, and you need to keep spraying them with water, or somehow gently watering the paper towelling without disturbing the seeds. Place the container in a warm, sunny location, preferably at child-height so they can go and check on them 10 times a day. 5. 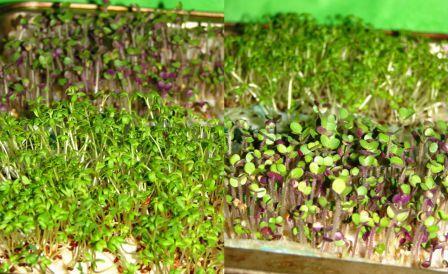 Harvest your mature cress and mustard for use in salads and egg sandwiches. Or just enjoy a little bit of Eden, grown in the comfort of your own home.